I've been listening to Justin Bieber and I love it. And yes, I am 30 years old. I finally packed away my Winter clothes. And yes, I am aware that it has not been winter for many months. I made a 4th of July wreath for my door. Does this surprise you? Probably not. I was anxiously awaiting the premiere of "Pretty Little Liars". And yes, I am still 30 years old. God has been speaking LOUDLY to my heart. As in: I started the "Breaking Free" study with the idea of 'breaking free from weight struggles' in my mind, and then the Reshaping It All challenge started, and then my pastor started a sermon series on temptation. Ok God, I'm listening! I may or may not be jumping on the iPhone bandwagon. I held out for almost 2 years Android! Hi Jess! Your little home on the internet is lovely. 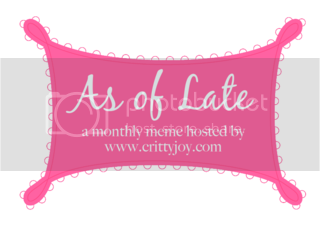 Thanks for joining us in our monthly As of Late link-up! Breaking Free is one of my most favorite studies ever. So challenging and life changing. Just saw the Justin Bieber movie last night! I really enjoyed it! A few of the catchy tunes are still in my head!